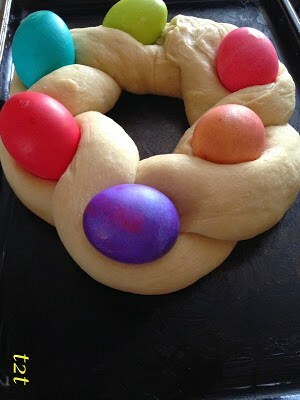 I have always wanted to make Easter Egg Bread. 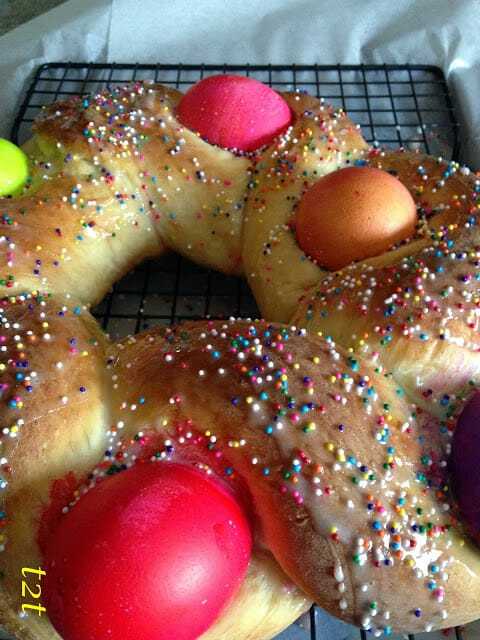 Not only will this bread look great on your Easter table, it’s delicious and relatively easy to make. 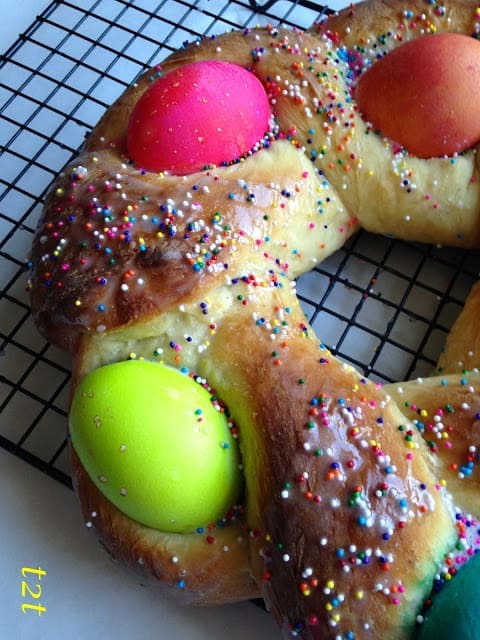 Easter Egg Bread is made with a sweet dough similar to a Brioche or Challah. 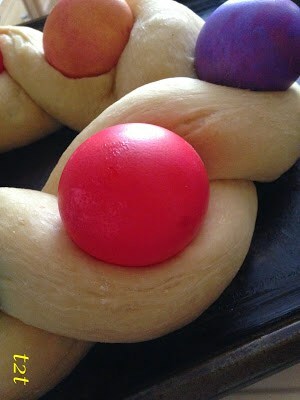 The raw colored eggs cooked beautifully in the oven, something I was a little skeptical about and the dough is really very easy to work with. 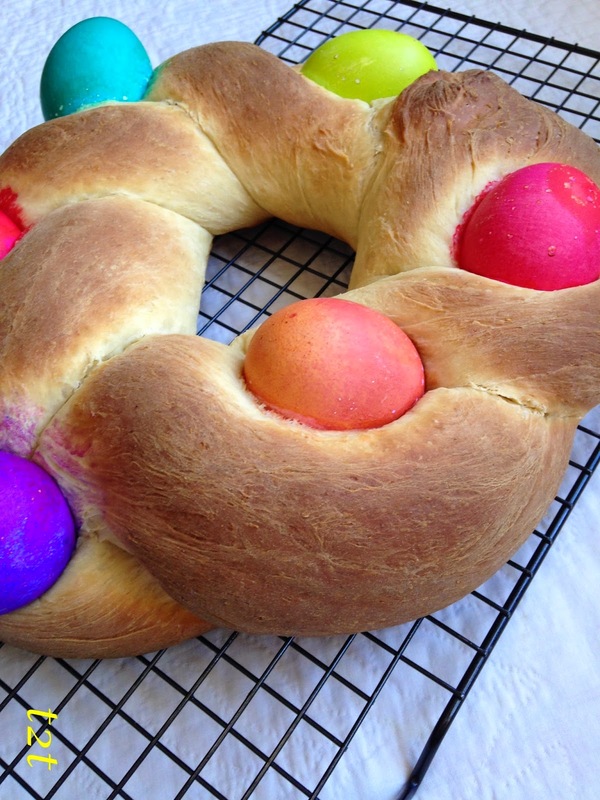 Easter Egg Bread is easy to make and is super delicious. 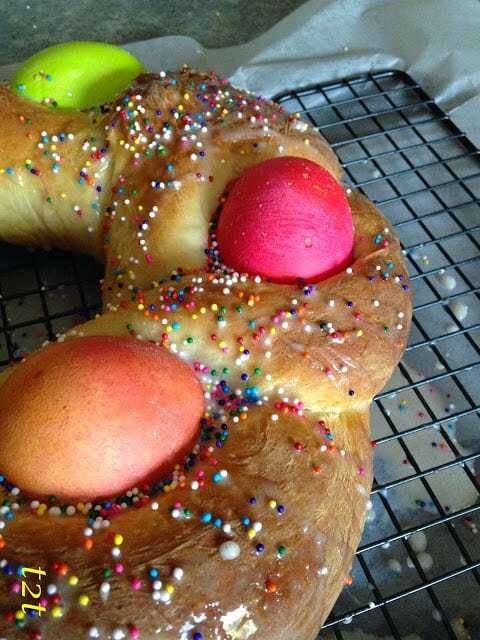 The perfect way to enjoy to your Easter morning. 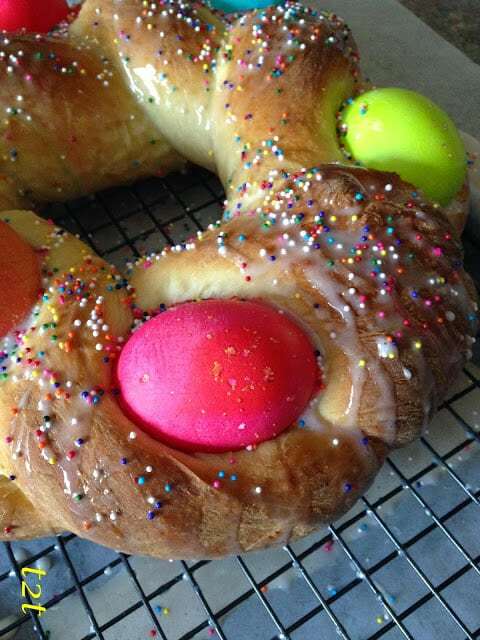 While the kiddies are hunting for their Easter baskets you can sit back and enjoy a warm slice of Easter bread with your morning cup of coffee. 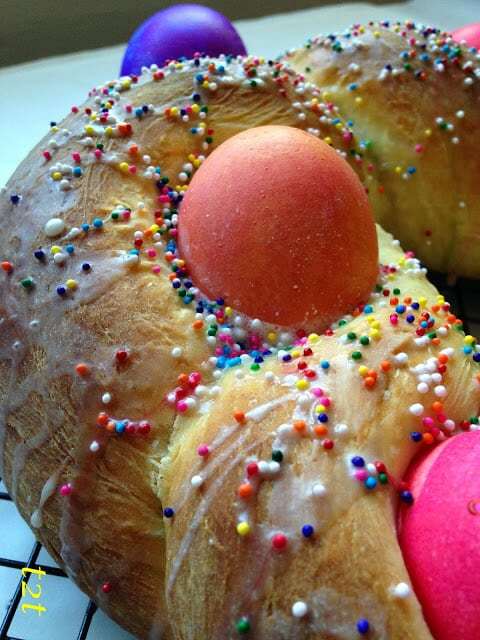 I will definitely be adding this bread to my Easter morning. Decide how many colors of dye you want to mix for your eggs. Set out as many glass cups or bowls. 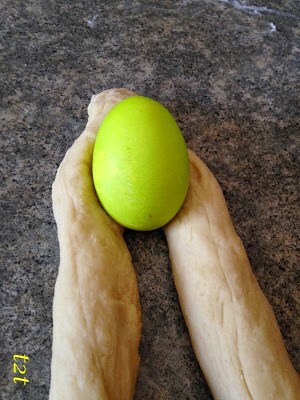 Make sure they are large enough to hold the eggs and the liquid needed. Add 2 tablespoons distilled white vinegar to each cup. Add 2/3 cup hot water to each cup. Add 7 to 15 drops food coloring to each cup or until you achieve desired color. 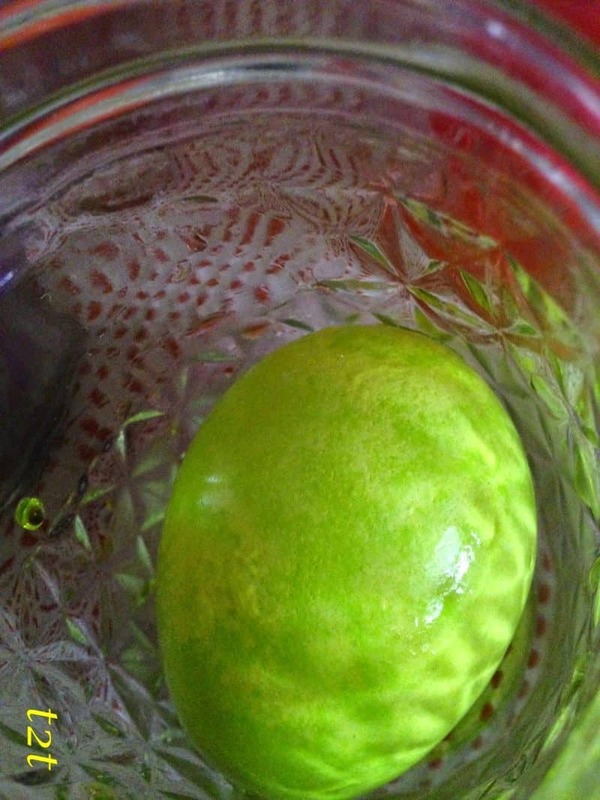 Carefully add eggs to water/vinegar. 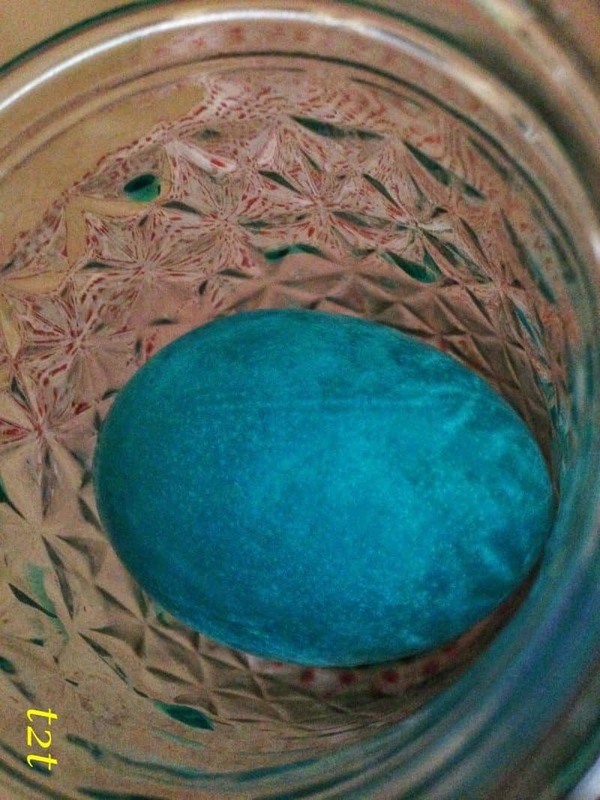 Allow raw eggs to soak until desired color is reached. Wipe dry. Store colored eggs in the refrigerator until needed. Mix together 2 1/2 cups flour, sugar, salt and yeast in a medium bowl. Add anise seed and lemon zest. Stir well. Place milk and butter in a small glass microwavable safe bowl. Microwave until milk is warm and butter has just begun to melt. Watch carefully. Make a well in the center of the flour mixture. Pour in the milk mixture and eggs. 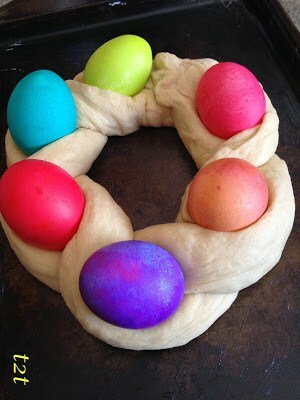 Swirl your hand in a circular motion to combine the flour mixture with the milk/eggs. 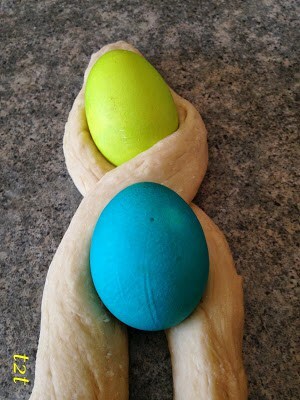 Mix well until a soft dough forms. Place dough on a floured surface. Knead in remaining 1/2 cup flour. Knead dough until soft but elastic, about 5 to 8 minutes. 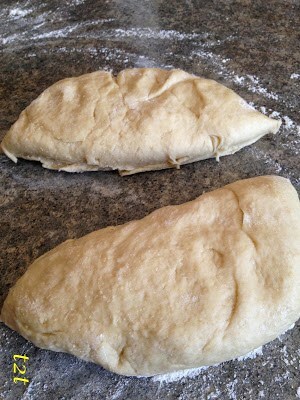 Add a small amount, about 1 teaspoon oil to your hands to prevent dough from sticking to them if necessary. 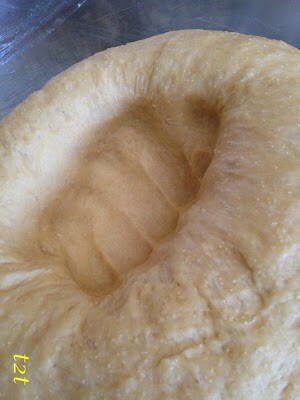 Place dough in a lightly greased bowl. Turning dough to coat. Cover bowl with plastic wrap and a damp towel. Place in a warm place to rise 1 1/2 hours. Punch down. Divide dough in half. On a floured work surface, roll each half into a ball. Shape the balls into 2 long ropes about 1-1/2 inches thick and 18 to 20 inches long. 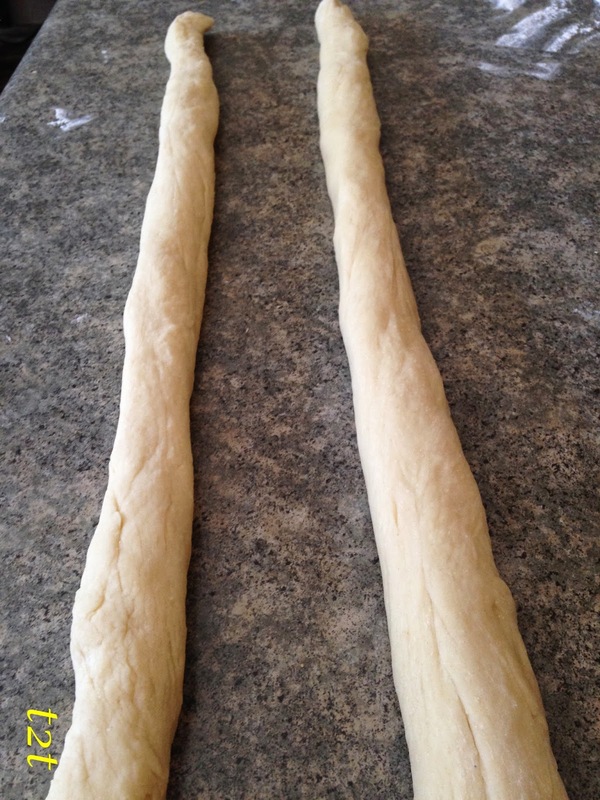 Lay ropes side by side on a greased baking sheet. Twist one end. 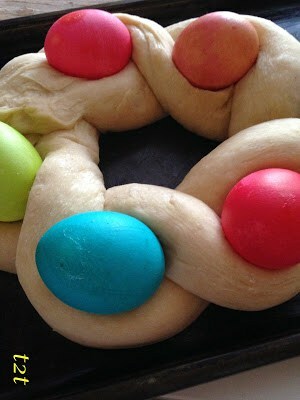 Add a colored egg. Twist ropes together. 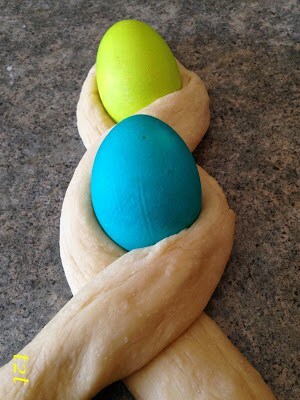 Add another colored egg. Twist ropes together. 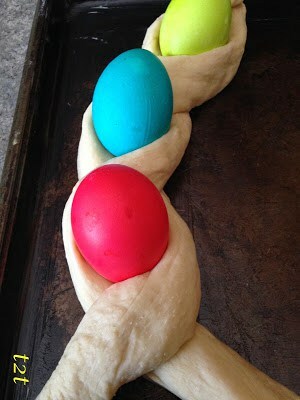 Add another colored egg. Twist ropes together. Add another egg. Add 3 to 4 eggs more. Form into a circle. Pinch ends together. Cover with saran wrap and damp towel. Let rise 1 to 2 hours. Whisk together lemon juice, melted butter, vanilla extract, and confectioners sugar until smooth. Add milk gradually until glaze reaches desired consistency. Preheat oven to 350° Bake for 25 to 30 minutes or until golden brown. Remove bread from oven. Place on a wire rack set over a baking sheet lined with parchment paper. Cool slightly. Drizzle with vanilla lemon glaze, sprinkle with sprinkles. 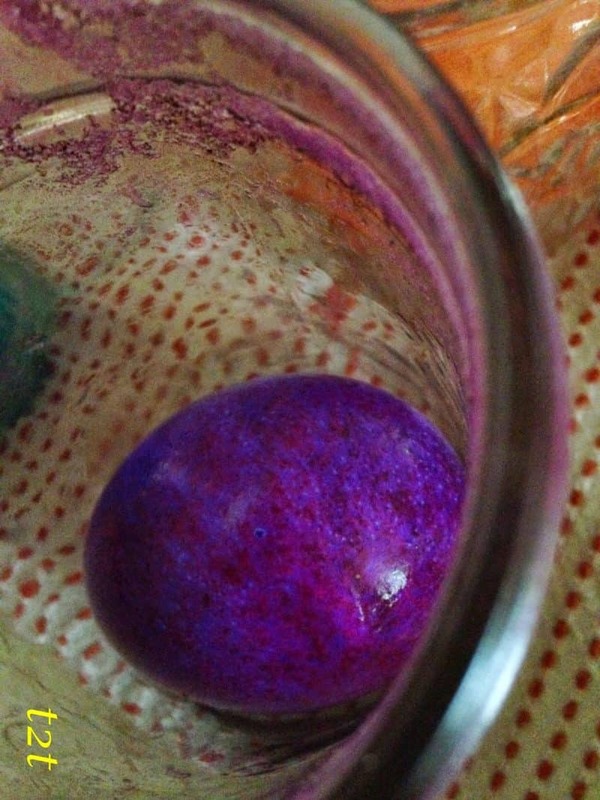 Decide how many colors of dye you want to mix for your eggs. Set out as many glass cups or bowls. 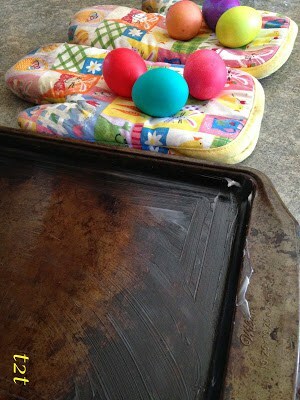 Make sure they are large enough to hold the eggs and the liquid needed. Carefully add eggs to water/vinegar. 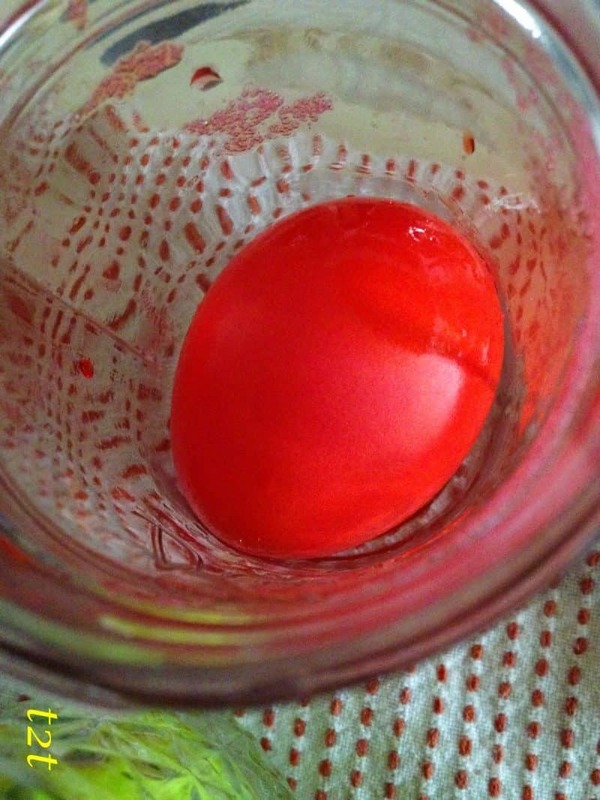 Allow raw eggs to soak until desired color is reached. Store colored eggs in the refrigerator until needed. Place milk and butter in a small glass microwavable safe bowl. Microwave until milk is warm and butter has just begun to melt. Watch carefully Make a well in the center of the flour mixture. Pour in the milk mixture and eggs. 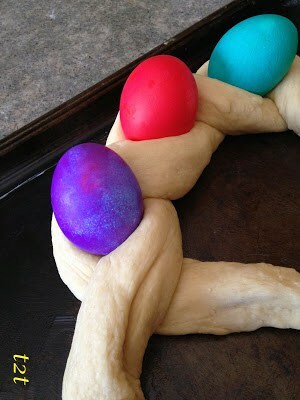 Swirl your hand in a circular motion to combine the flour mixture with the milk/eggs. 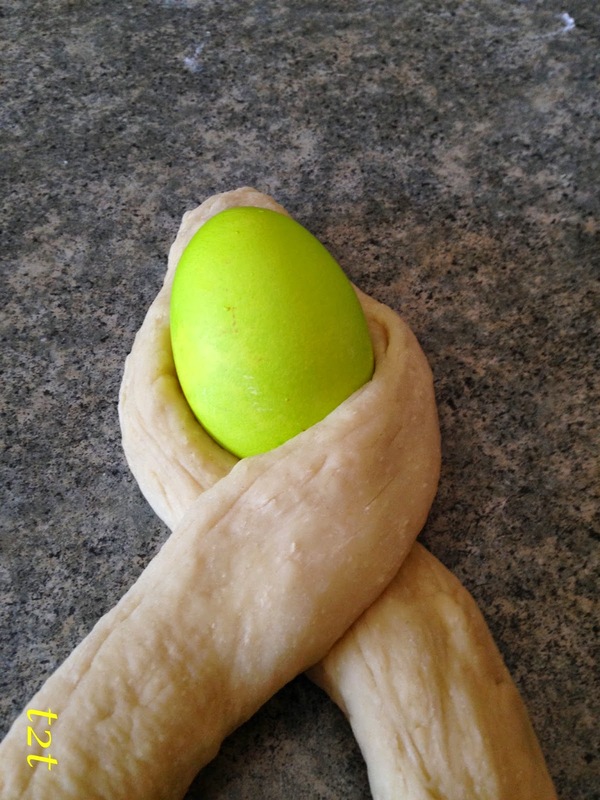 Mix well until a soft dough forms. 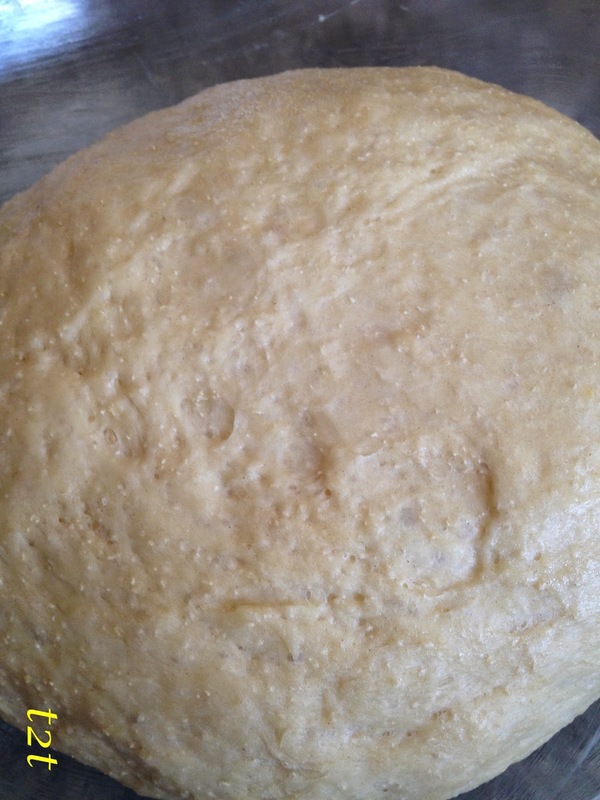 Place dough on a floured surface. Knead in remaining 1/2 cup flour. Knead dough until soft but elastic, about 5-8 minutes. Add a small amount, about 1 teaspoon oil to your hands to prevent dough from sticking to them if necessary. Place dough in a lightly greased bowl. Turning dough to coat. Cover bowl with plastic wrap and a damp towel. Place in a warm place to rise 1 1/2 hours. Punch dough down. Divide dough in half. 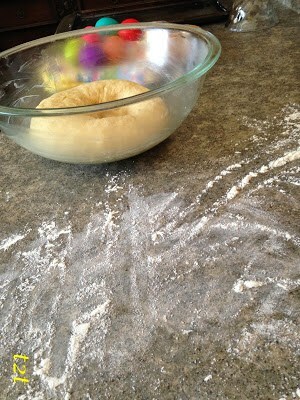 On a floured work surface, roll each half into a ball. Shape the balls into 2 long ropes about 1-1/2 inches thick and 18 to 20 inches long. Lay ropes side by side on a greased baking sheet. Twist one end. 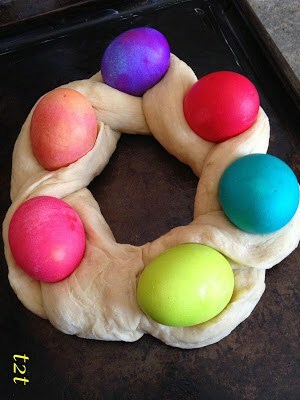 Add a colored egg. Twist ropes together. Add another colored egg. Twist ropes together. Add another egg. Add 3 to 4 eggs more. Form into a circle. Pinch ends together. Cover with saran wrap and damp towel. Let rise 1 to 2 hours. Remove bread from oven. Place on a wire rack set over a baking sheet lined with parchment paper. Cool slightly. Drizzle with vanilla lemon glaze.